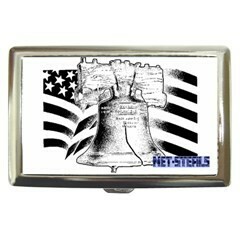 Net-Steals brand new high quality silver chrome with a matte finish, cigarette case, wallet, or credit card case, is a double sided case which can hold 16 cigarettes. The size of the case is approximately 4" x 2 1/4", and 1/2" deep. If you do not smoke it will hold credit cards, money or whatever you want. Winning buyer to pay $7.50 shipping to anywhere within U.S. Canada or outside of U.S, the shipping will be $18.95. Payment is expected and required to be received within 48 hours and forms of payment accepted are by Paypal in US Dollars only. For the Net-Steals branded items, please allow 2 o 4 weeks for its production and delivery.